8am - It may seem like an inconsequential thing, but I wanted to receive my pajamas back from the lavanderia this afternoon. The word "lavanderia" in Spanish is "laundry" in English. Almost all of the clothing that I brought with me to Guatemala, was now in my dirty clothing bag. Including my pajamas. Call me picky, but I don't like going to bed without pajamas on. So, I arrived at the lavanderia this morning at 8am. I am the very first customer. "Is it possible to receive my laundry back this afternoon? ", I asked. "Sure! ", was the reply. 11:30am - I am at Lazzarini Pizza for breakfast. When I first arrived at Panajachel, it seemed to me that only a few of the lunch and supper restaurants also offered breakfast. However, now nearly all of them have large breakfast menu boards on the street in front of their buildings. And many of these menu boards copy the others, word for word! 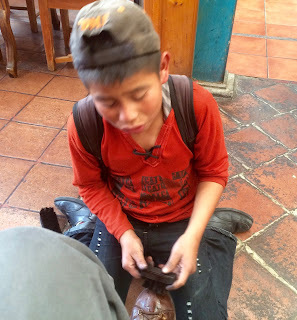 1pm - There may be as many as 30 shoe shine boys on Avenida Santander in the Town of Panajachel. This means that I am very often saying "No" to their question of, "Shine?" I do not know what gets me to say, "Yes!" to one boy over another. But some of these boys work very hard. I can tell by looking at their very stained hands. Also, the successful shine boys always carry enough money to make change! 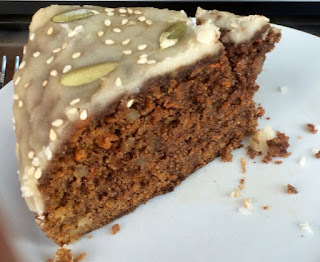 1:30pm - I walked back up Avenida Santander to Cafe Kitsch for a piece of their carrot cake. Their carrot cake is very good! Moist, with a delicious frosting. I almost missed taking a pic of my carrot cake. Because I'd taken a forkful before snapping the pic. But I "stitched" the piece of cake back. 7:30pm - I have returned to Lazararini's because I have had really good pastas here. I do not know what is up here this evening. But Lazarini has three large groups. It's a good thing that I ordered when I did, or I might not get my pasta for a long time! I have ordered Fettuccine Dagony. I have no idea what or if "Dagony" means something in Italian. I hope that it is not a mis-spelling of "agony!" The pasta comes with garlic bread, which I really like a lot. It's odd to hear so many shoe shine boys hustling for business when they should be in school. Apparently no laws against truancy. I asked many shoe shine boys about that. They told me that they go to school in the afternoon. However, this boy that shined my shoes this afternoon might have been one who is skipping school. He was working in the afternoon. Seems as if there are a lot of Italian places there George. Is this unusual in Central America do you think? I suspect that the restaurants in Panajachel that are along Avenida Santander, are extremely competitive with each other. If one restaurant is doing good with Italian, the other restaurants try the same thing. What was the Fettuccine Dagony? Hope it wasn't misspelled 'agony.' (smiling) Looks good in picture. 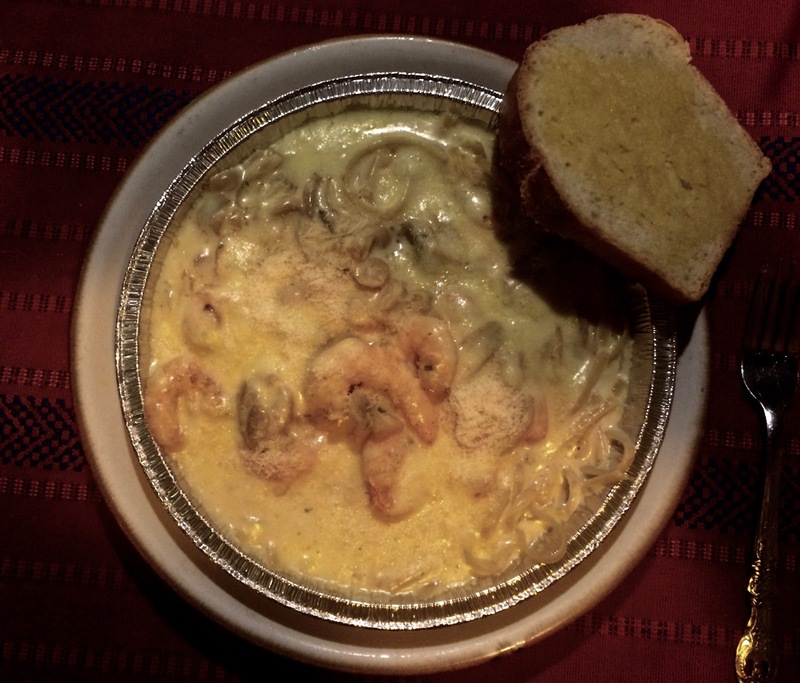 Fettuccini Dagony turned out to be pasta with a lot of shrimp. It tasted good! I love carrot cake. I was surprised to see English Muffins = Bill and I were just saying we couldn't find any here in Mexico. We are heading towards home. Enjoy reading your adventures again. 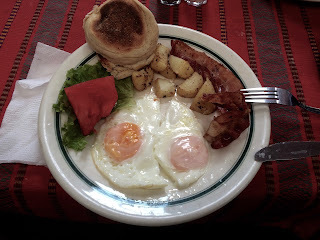 All of the restaurants here in Panajachel that serve breakfast offer "English Muffins." However, they only "look" like English muffins. They taste like a cross between a biscuit and bread.